Usually when I get sent books without requesting them I have a little look at them at them and then they get put on the TBR bookcase and they can stay there quite a long time. When I opened the parcel with The Bone Dragon by Alexia Cassale it stood out and made its way to the top of the pile rather quickly. Not only is it visually stunning it but the blurb had be really hooked already. Dragons, thriller, contemporary meets fantasy: YES PLEASE. I couldn’t wait to start it. Evie is broken in many horrific ways and she’s slowly healing but there are some wounds that don’t heal as easily as a broken rib. She’s been abused in her past and now that she’s got a new life with adoptive parents and friends at a new school she is learning how to be at ease again. It’s harder than you’d think when you can’t help but go cold whenever you sense someone looking over your shoulder or watching you. 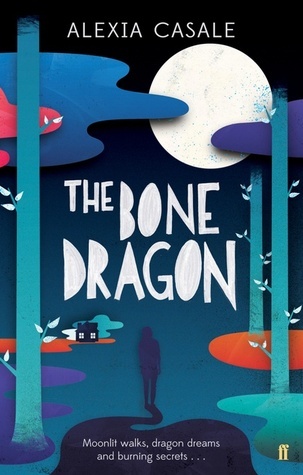 Evie’s new parents do their best to help her fight her demons but it takes the appearance of a Dragon made from a removed damaged rib bone to change her life. How will Evie ever heal with all these skeletons lingering in her life and how will her new family fully come together when there is such sadness already in their lives? I utterly adored this book because it gave me a way of understanding what it’s like to struggle with issues as big as these without ever having experienced them personally. That’s a real credit to the writing ability of Alexia Cassale. She’s a hidden gem of writing and I’d be surprised if this book doesn’t get continual praise upon its release date. It really did break my heart at times seeing Evie struggle so much even after all she’s been through. The fantasy element really is such a clever way of discuss issues that are so difficult to approach because they are just that awful to even think about. A truly wonderful book that has the power to make you wish for a bit of magic to exist in the world for those that need it. Wow – I too was entranced by that cover. Thanks for the review – I'm really excited to read this now! What a great review, I'm really looking forward to reading this one as well!